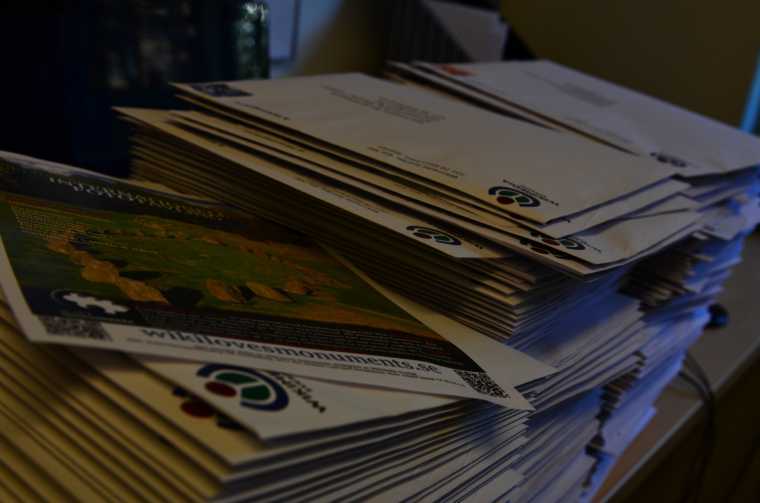 Yesterday we finished off printing, stamping and putting together 348 envelopes about Wiki Loves Monuments, which are to be sent to schools, photo societies and tourist offices in Sweden. We’re suggesting schools to have their own contest whilst learning about the cultural heritage sites present in Sweden. We’re also emailing scouting groups and university societies to increase participation whilst acknowledging our cultural treasures and their importance in human history. The current, highly dedicated, team in Sweden working with the competition organization is made up by an employee at Wikimedia Sweden, some active volunteers and even an intern. Last year Wiki Loves Monuments was already successful in Sweden, where participants contributed with around 5000 new photos to Wikimedia Commons. This year we are aiming to double that participation! We are hoping that teachers, scouting groups, university societies and others receiving our letter and emails will eagerly contribute to this year’s competition. For tourists visiting Sweden, please find information about the cultural heritage sites to photograph at http://wikilovesmonuments.se/in-english/ .